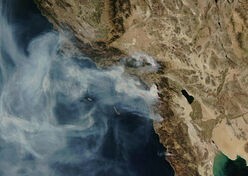 Even for the literal-minded, it was hard not to lump the conflagrations on Wall Street with those in Southern California. The meltdown of 401(k)s with the street signs at Sylmar. The frantic, ever-escalating press conferences and bailouts of any significant credit institution with the desperate deployment of ever-greater masses of engines and helitankers, all equally ineffective. Somehow the spark of a credit crunch managed to leap over fiscal firewalls and spread throughout the economic landscape, much as relatively small blazes blew over I-5 and threatened the power supply of Los Angeles. The general destruction has moved upscale, so that trophy homes burn along with trailer parks, and hedge funds with day traders. When the winds blew, they exposed any combustible object to embers, and threatened to incinerate anything vulnerable. The entire system, it seems, is vulnerable, and everyone knew that the winds always blow. It’s just been convenient to pretend otherwise. Another round, this time without the Santa Anas to drive them over and through the Transverse Range. More blowups. More houses burned. More evacuations. More declarations of disaster and states of emergency. More crews, more planes, more helicopters, more TV cameras. More posturing. Meanwhile, the Great Recession continues, refusing to be extinguished. 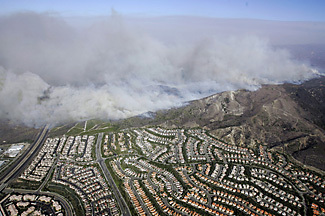 Investors applaud each stock market rally as homeowners in Altadena do retardant drops by DC-10s. The fires continue for the same reason the economy continues to smolder, because the fundamentals have not changed. Until they do, we will be left with damaging breakouts and political theater. Like economic transactions, fire is not a substance but a reaction – an exchange. It takes its character from its context. It synthesizes its surroundings. Its power derives from the power to propagate. To control fire, you control its setting, and you control wild fire by substituting tame fire. In fire-prone public lands, where the setting will not convert to shopping malls and sports arenas, some fire is inevitable and some necessary. From time to time a few fires will go feral. Without fire some biotas will only build up combustibles capable of stoking still-more savage outbreaks, and equally, some will cease to function. Fire is a force of “creative destruction” in nature’s economy. 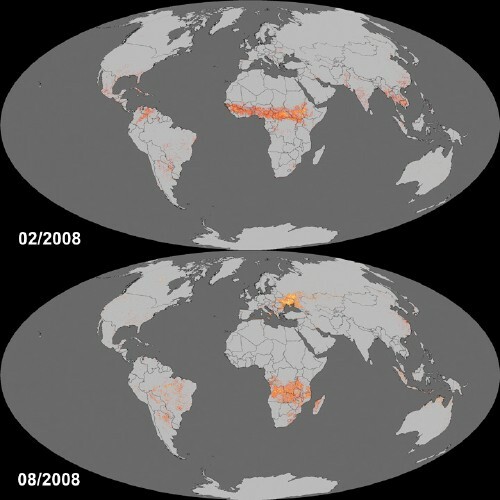 Without it, particularly in drier landscapes, nutrients no longer circulate freely but get hoarded. It’s as though organisms hid their valuables in secret caches dug in the backyard or in socks under the bed. The choice is not whether or not to have fire but what kind of fire we wish. Current climate projections point to an increase in fire-weather risk from warmer and drier conditions. Two simulations used by Australia’s lead scientific agency, CSIRO, and the Australian Bureau of Meteorology point to the number of days with very high and extreme fire danger ratings increasing by some 4-25% by 2020, and 15-70% by 2050. The agencies’ Climate Change in Australia report cites the example of Canberra which may be looking at an annual average of 26-29 very high or extreme fire danger days by 2020 and 28-38 days by 2050. Australia knows better. 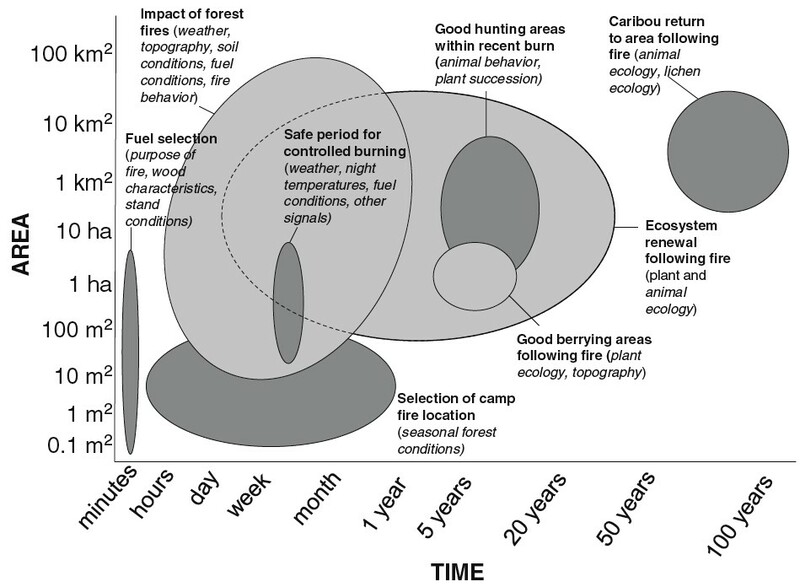 It developed many key concepts of fire ecology and models of bushfire behaviour. 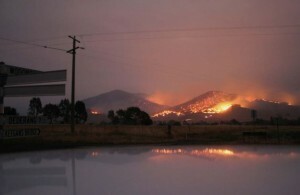 It pioneered landscape-scale prescribed burning as a method of bushfire management. 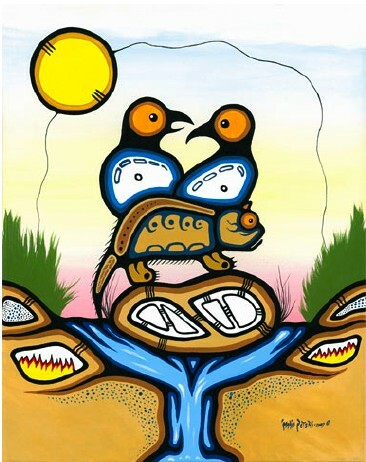 It devised the protocol for structure protection in the bush, especially the ingenious stratagem of leaving early or staying, preparing and defending. In recent decades it has beefed up active suppression capabilities and emergency services. … Yet Australia keeps enduring the same Sisyphean cycle of calamitous conflagrations in the same places. It isn’t translating what it knows into its practices. It seems to be abandoning its historic solutions for the kind of telegenic suppression operations and political theatre that have failed elsewhere. Even when controlled burning is accepted in principle, there always seems a reason not to burn in this place or at this time. So the burning gets outsourced to lightning, accident and arson. It’s too early to identify the particulars behind the latest catastrophe. But it’s likely that investigation will point to the same culprits, perhaps aggravated by climate change and arson. Both are relevant, but both are potential distractions. Global warming might magnify outbreaks, but it would mean a change in degree, not in kind; and its effects must in any case be absorbed by the combustible cover. Arson can put fire in the worst place at the worst time, but its power depends on the capacity to spread and to destroy susceptible buildings. Yet neither is fundamental. With or without global warming or arson, damaging fires will come, spread as the landscape allows and inflict damage as structures permit. And it is there – with how Australians live on the land – that reform must go. Australia will have fire, and it will recycle the conditions that can leverage small flames into holocausts. The choice is whether skilled people should backburn or leave fire-starting to lightning, clumsies and crazies. After the 1939 Black Friday conflagration, a royal commission set into motion the modern era of bushfire management. At the time the official ambition of state-sponsored conservation was to eliminate fire as far as possible, and through fire exclusion alter the character of the landscape so it would become less fire prone. Leonard Stretton asked the nation’s forester why he continued to hold this view when it had never succeeded, when bushfires had inevitably wiped out his every repeated effort. Wryly, Stretton mocked the absurdity of those who sought to make sunburnt Australia into green England. Black SaturdayII will yield another royal commission. Much has changed in 70 years; Australians are more urban, more sensitive to environmental issues, keener to protect unique ecological assets. Yet perhaps they are substituting another, more modern delusion: striving to remake the burning bush into an unburnt Oz, only to find this vision also repeatedly obliterated by remorseless fire. Good points, but I think he under-states the change in settlement patterns, as increasing number of people live in ex-urban areas that complicate fire management, and also the risk that climate change produces a disequilibrium between vegetation and climate that can result in much larger than fires one would observe in an equilibrium climate. Stephen Pyne is also on an ABC radio podcast discussing the environmental history of bushfire in Australia. There are no absolute assurances that wildfire will not from time to time spill over into settlements, any more than markets won’t fizz and bubble; but we know how to keep such outbreaks from happening routinely. It’s messy, irritating to fundamentalists (both those of the wilderness and of the market), and not cheap. So far, we continue to drop money and fire retardant on the flames. That may not quench the fire but it makes good political theater. At some point, however, the money will run out completely and it will no longer be possible to pretend that we can rebuild; everything will simply burn to ash. We will have to deal with the landscape itself. The power of fire resides in its power to propagate: you control that power by controlling fire’s environment. So too the power of fiscal contagion requires control over the entire scene. For the present we’re caught between two nasty fires. It’s time we put some distance between ourselves and both of them. We can’t control the winds, we only know they will blow again.